Because Plantworks propagates close to 60% of its plant material, there was a need for an intermittent mist system that could be programmed to apply water on misting beds at different times. Photos courtesy of Plantworks. Plantworks Nursery began a mission of water conservation in the early 2000s in response to drought conditions in North Carolina. Quality plant material has always been of the utmost importance at Plantworks, and so much of our plant health depends on the method and amount of water it receives. Plantworks uses a combination of watering approaches: hand, overhead irrigation, mist heads, and flood beds. Overhead irrigation is only used for fool proof crops such as daylilies, Hosta, Mondo grass, and Liriope. Up until 2010, all other crops (annuals, perennials, ferns, tropicals, herbs, ornamental grasses, and groundcovers) were watered by hand. However, hand watering is the hardest technique to teach a grower, and locating labor is becoming increasingly difficult. After brainstorming and researching flood beds, drip irrigation, and drip tape, we decided to trial a few flood beds in our perennial section. We knew it would cut down on the amount of time it would take that grower to water, and we hoped to see increased plant health from watering from the bottom up instead of the top down. We built the beds in-house with 2x4s and pool liners. We piped them from existing water lines and installed drains to drain excess water when flooding was complete. Almost immediately we saw significant time savings, and foliar diseases decreased dramatically. 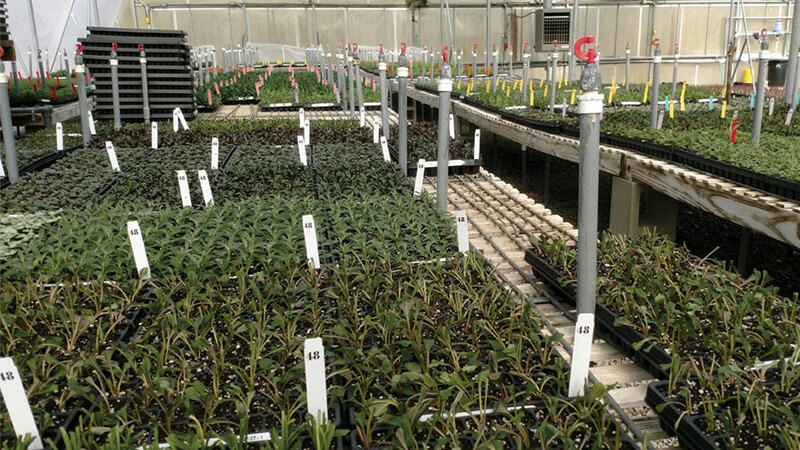 Plantworks propagates close to 60% of our plant material. This meant there was a need for an intermittent mist system that could be programmed to come on at different times and stay on for different lengths of time depending on the crop. Typical irrigation controllers haven’t been able to be programmed in such a way to meet our needs. We had been using a Mistmaster 11 from Superior Controls for years, and as they have worn down, we have replaced them with an EPIC-40 from ECO-Precision Irrigation Controls and a DRAMM Mist-Time. The EPIC-40 was built to handle what we needed it to do, and we were able to get it set up and running quickly. It’s very user friendly and easy to teach others to program. Unfortunately, the manufacturer is a one-man show who is retiring and there isn’t anyone in line to take over the business. This leaves us very susceptible, as we may need replacement parts and servicing in the years to come. Knowing that situation, we purchased the DRAMM Mist-Time in hopes that we could accomplish the same thing. It is accomplishing the task, but was more complex to set up and can be more difficult to teach others how to use. As a grower, you are faced with new challenges every day. It’s important to keep an open mind in order to accommodate your needs, even when the circumstances aren’t in your favor. Once we implemented these systems and trialed them, we wrote protocols and operator guidelines to ensure that we don’t forget key points between the seasons. Dana Massey ([email protected]) is President of Plantworks Nursery in Rougemont, NC. See all author stories here.